← Not bad for an old lady! populated with oversimplification of the issue – and usually led by people for whom weight has never been an issue. They have these online “debates” under the pretext of welfare concerns for the horses – yet there are many very small horses ridden, all over the world, by riders who exceed the discussed weight limits just by being adult humans. These critics do not call out tall riders, or adults riding ponies – only “overweight” or “fat” riders. The reality is that it is purely an aesthetic debate masquerading as a welfare issue. So, here is my dirty little secret (well, secret if you’ve never met me) – I have been overweight my whole life. What has this meant for the welfare of my horses? Well, quite frankly, not much of anything. I have Evented, shown Hunters and Jumpers, and trained and shown Dressage. 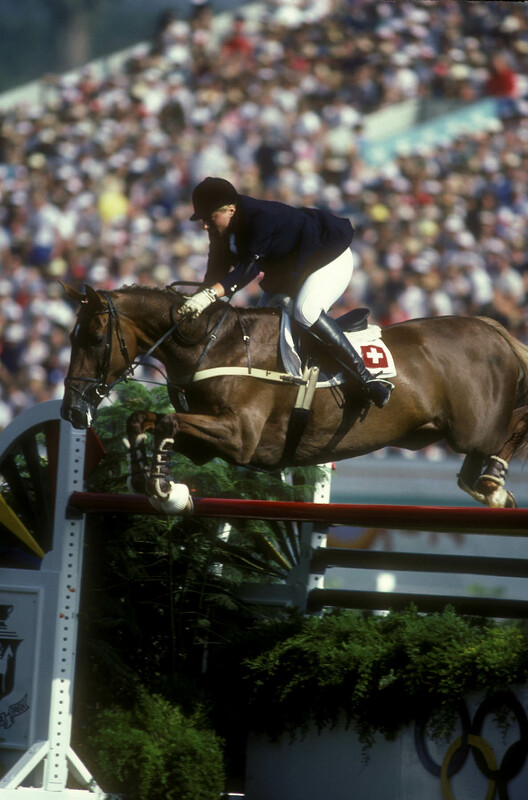 I have been lucky enough to have trainers that held no bias toward me, though my Hunter/Jumper trainer expressed her concern that, as talented as I was, no one would ever take me seriously – a concern that proved well founded. Ironically, I now see riders winning who are heavier than I was then – that is neither here nor there, just an observation. But through all of my riding career, my horses have stayed incredibly sound and healthy, and there were only three times that any of them experienced any back issues – one from a bad slip on slick footing, one from a ill-fitting saddle, and Nash’s, which turned out to be a pelvic fracture from a stall accident. great discomfort and soundness problems, due to lack of balance, inability to follow the horse’s movement, or rough/abusive hands. I knew a woman who was a slim five foot one inch, riding a rather large 16.3 hand warmblood gelding. A lovely woman, but never able to properly sit on her overlarge horse, with the result that she was hard on his back and mouth, leading to monthly visits from the chiropractor. 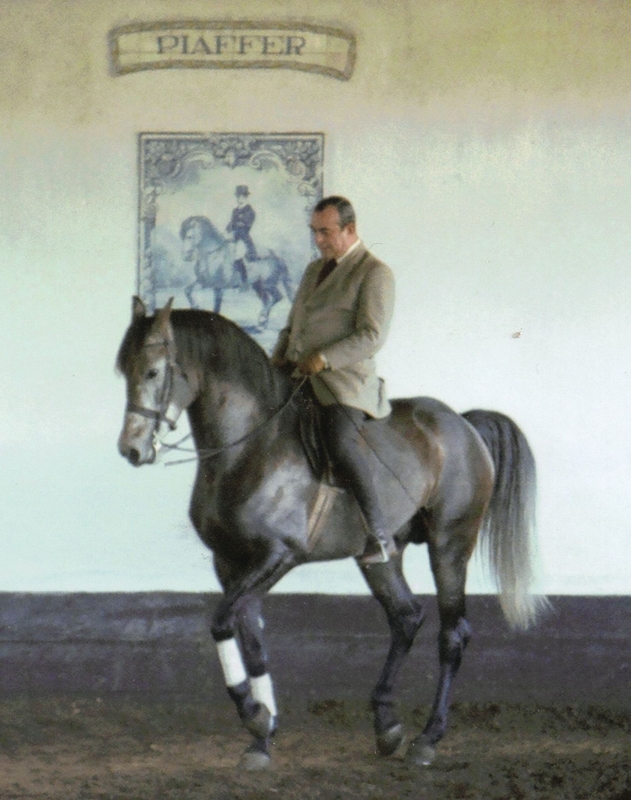 I had easily fifty pounds on her, and my mare was a far lighter boned mount (though also 16.3), yet we could dance through pirouettes and piaffe with the greatest of ease. 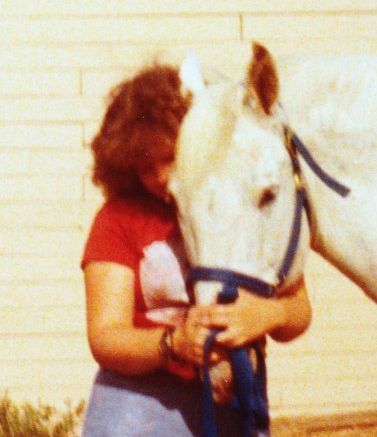 Perhaps my greatest proof that weight is not the huge issue people have always made it came at a Pony Club exam. I was given a refined Thoroughbred mare, in the horse switch for the jumping phase. She was hot, quick and had already dumped her own rider twice that day. It was clear the other girls were waiting for the “fat kid” to fall hard – I disappointed them. Instead, after a fifteen minute schooling session, the mare was round, soft and calm. We completed the course in relaxed show-hunter style. The mare’s rider was none too happy with the result – and even less so when she was unable to get my own prize winning show hunter to navigate the course! 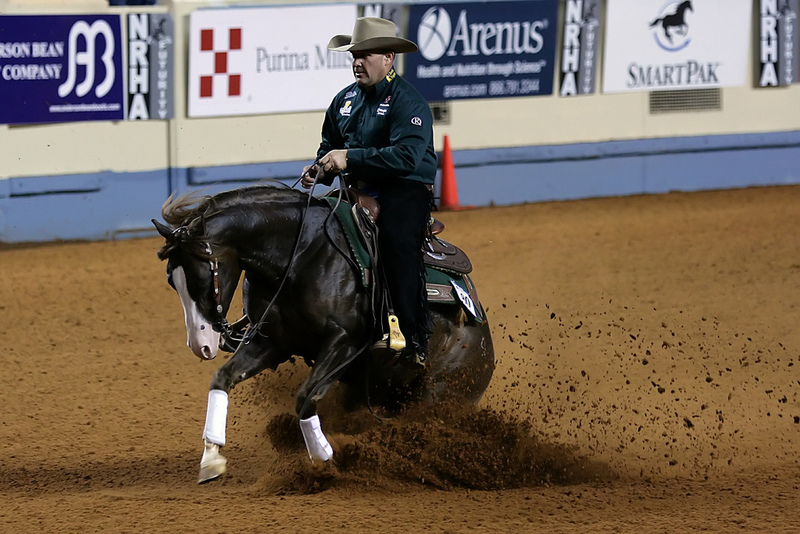 Big man, big saddle, small horse – yet one of the top reining competitors in the country, and not likely to be questioned over his weight. softening, and her jump had more bascule. She certainly was not so overburdened that she could not take a big spot at an oxer and clear it! Her usual rider was at least fifty pounds lighter – but she banged the mare in the mouth, and landed too soon on her back, over every fence. Although far lighter, she was a much greater burden than I – and the mare’s behavior was the proof. I am not saying that weight should not be a consideration in riding. Certainly, if a horse is clearly overburdened and struggling, an instructor should speak up. But I have seen horses overburdened when weight was not a factor. Ironically, during all those years when people were saying that I should not ride, there were men riding tiny Quarter Horses in cutting and reining (still are) on much larger saddles, doing things that are much more influenced by excess weight than Dressage (a sport where the point is supposed to be to optimize the horse’s strength and balance, to improve their ability to carry their own weight and ours). Robbiani put in lovely jumping rounds on her clever chestnut mare, Jessica, while rude folks around me made horrible comments about her weight. Here was the third best in the world, still subject to the same comments I was all too familiar with! But it was the reaction to my weight at an instructors forum that finally pulled the plug on my serious riding ambitions. It was in a critique of my instruction, on the first morning, that someone felt the need to focus on my weight. According to her, if I did not have the dedication to lose the weight, I did not have the dedication to be a Dressage rider. This person did not know me – at this point she hadn’t even seen me ride. She did not know the sacrifices we have made just to have the horses, all the extra jobs I held just to afford a few lessons. I would have put my level of dedication up against anyone’s! But this was my last straw. For decades I’d worked hard, knowing that some day I would prove to everyone that I could do it. I thought that training my mare to the highest level Dressage movements would do it. We were the stars of the forum, floating from haunches-in (travers) to shoulder-in to haunches-out (renvers) with ease and truly invisible aids – mastering every new exercise with aplomb. Yet it eventually all came down to my weight. To be honest, the Dressage world was already taking a direction that I didn’t like – this was just the tipping point. 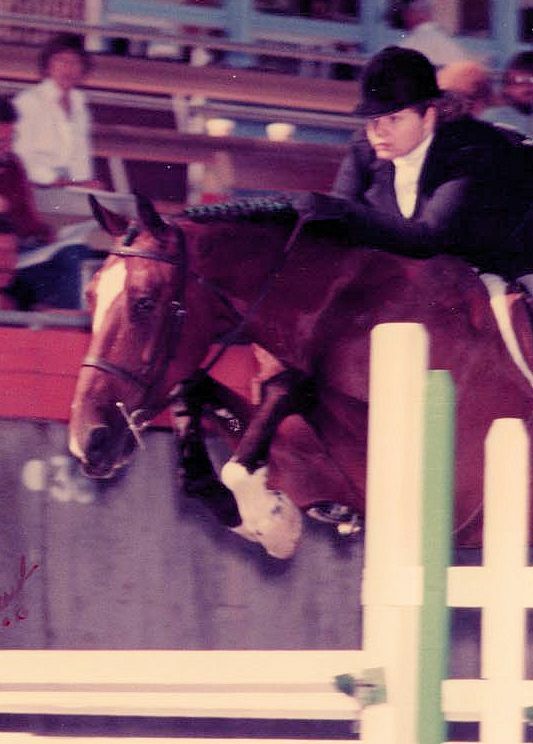 I stayed dedicated to my horses and my “craft”, but left the competitions and public events behind. I will admit that, when my job took over my life, I gained more weight than when I was riding multiple horses. When I decided to try serious riding again, my first goal was to get rid of that extra weight. I have lost nearly 50 pounds – but it has taken a few years, and the rate of loss has already slowed down considerably. I eat the right foods, and I eat very little (to the point that friends often worry, but no need for that). I walk on my breaks at work, two to three times a day, at a pace that gets many comments from co-workers and passers-by. But, I still weigh in at around 200 pounds. The lightest I have been, since my mid-teens, was 185 – that was after several months of physical labor on a farm, eating an almost literally bread and water diet. Those who debate the rider weight issue often comment that the riders should stop making excuses and just eat right and exercise. Clearly it’s not that simple! I know that these debates will continue – with the increase in obesity, it’s inevitable. But let’s not pretend that this is about horse welfare. As I said, if it were, they would also discuss very tall men, and other horse/rider size mismatches. But they don’t. The discussion is about overweight/fat riders. I get it – people don’t like to see all that jiggling. Truth be told, most of us overweight riders would tell you we’re not too happy watching ourselves! But we also tend to be very careful and cautious, in favor of our horses – knowing full well that we have to compensate for the extra burden. You will see few, if any, photos or films of me – at least until I feel that I am riding at my best. I am undecided as to whether I will ever show my horses, because I will never fit that tall, slim image everyone has of what a rider should be. I will still enjoy my horses, continue to learn, and try to provide them the best lives I can. In the end, isn’t that really what we should want for all horses? So, if you don’t want to watch us “jiggly” riders – we’ll forgive you for looking away. Just please keep the nasty comments to yourself! This entry was posted in My Journey and tagged Dressage, horse swapping, horse welfare, hunter, jumper, Pony Club rating, rider as burden, rider fit to horse, rider size, rider weight, soundness. Bookmark the permalink.